There are plenty of Halloween celebrations and events around the country this half term, making it an ideal time to get spooky with the whole family. We’ve put together some low-cost ideas to help you have a monster bash without breaking the bank. Bristol Zoo is putting on a Halloween extravaganza this half term, with plenty of activities and fun events to look forward to. Alongside regular Bristol Zoo attractions like animal talks and feedings, your kids can have a go at themed arts and crafts or try out the Haunted Trail. There’s also a parade and a chance to get up close and personal to some creepy crawlies. Best of all, kids’ tickets are just £5 this week so you don’t need to splash the cash to have a good time. Bristol Zoo has lots of wildlife to enchant the whole family, from red pandas to penguins, plus lots of exciting play areas to keep the kids active. This week, the Charterhouse has some fun, hands-on Family Fridays to celebrate Halloween. Kids can try their hand at making a clay gargoyle to take home, or get the whole family involved with pumpkin carving. Family Fridays are only £3.50 per child, with adults and under-fives available to attend for free. Or, if you can’t make it down, why not try carving some pumpkins at home? There are plenty of online resources to help you get started – just put down some newspaper to catch the mess! The Royal Botanic Garden Edinburgh is putting on a Halloween Trail, complete with an adventure element. Kids can help witch’s cat Mì-àgh along the trail whilst enjoying the gardens, all for only £2 a ticket. The Botanic Garden features a range of exotic plants, gardens, and glasshouses across 70 acres of land. The Garden puts on daily tours and offers afternoon tea for a treat after the Trail. Plus, autumn is a great time to visit as the plants are changing colour. Trick-or-treat is a Halloween staple - but it’s even better when you’ve made the treats yourself! From traditional favourites like toffee apples to modern classics, it’s easier than you think to make tasty sweets at home. Not only can it save a bit of cash on store-bought confectionery, making your own sweets is a great way to spend some family time in the kitchen. Plus, you’ll know exactly what’s going into your treats, so you can customise to your family’s dietary preferences and tastes. Have a look online for easy recipes and ideas. Everyone is welcome to take part in the Halloween Fun Run at Manchester’s Heaton Park this half term. Following an easy 5km route, participants of all ages are invited to run, walk, or jog, meeting various spooky characters along the way. The historical Heaton Hall is hosting the event, providing refreshments and music to keep you entertained all afternoon. Participants will receive a ghoulish goody bag at the end of the route, and there’s plenty to see and do around Manchester if you’re looking for a family day out. This is a great, active way to celebrate Halloween - just keep clear of those monsters! 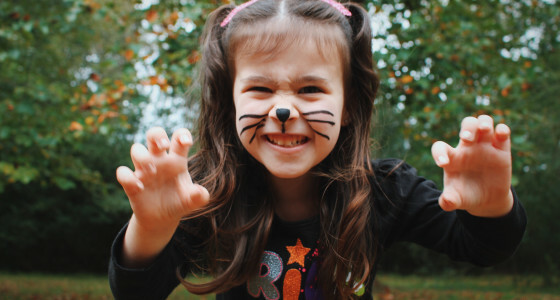 Have you got any low-cost plans for Halloween this half term? Let us know in the comments below!